Apart from Thanksgiving, I’ve had a restful weekend. On Thursday, I had too much food without any room and I hopped around between several parties. The first one with my local friend Brian did me in as I visited him and his family, only to be done in with the traditional turkey, stuffing, mash potatoes, and gravy. Then, I stopped by my mother’s party at her business where she was serving sukiyaki and oden for her employees. I had my sampling, enough so neither she nor her friends nor employees got offended that I didn’t eat anything. I then went off to another friend’s gathering where they were having a gay movie marathon and I escaped being there until 3 in the morning. Last year, I wound up staying too late as Jaylen got us all watching The Book of Daniel, the entire series in one night’s sitting. David, a longtime friend of mine and fellow Netflix subscriber, showed me the link for Netflix’s Instant Viewing Beta Program for Mac. It’s frustrated me for a while that I was paying all this money to subscribe to Netflix and I was getting bupkis as far as the Instant Viewing program was concerned. It’s safe to say I wound up watching a lot of movies and TV shows this weekend as it saved me from A) installing Vista on my Mac and B) buying something like the Roku player. 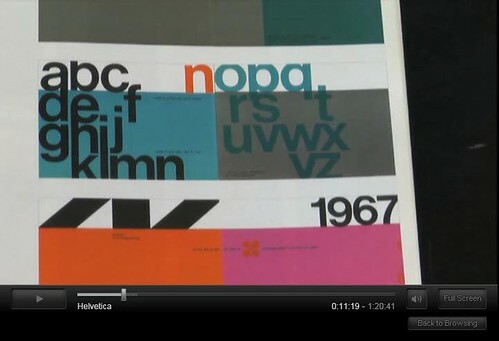 Below is a screenshot from the documentary Helvetica, which is available for instant viewing. Oh, here’s the link if you’re a Mac user and want to get on the beta test for Netflix’s Instant Viewing. I avoided the whole Black Friday thing. Not really. I didn’t take part in the tent cities that sprouted around places such as Best Buy, Walmart, Target, etc. At the Mission Valley Best Buy, there were some people who set up tents near the entrance on Tuesday. I hope it was worth it for them to get stinky and rained on and shiver a bit in the late November San Diego nights. However, I went with Brian to the Otay Ranch Town Center in the late afternoon. We were simply browsing around a few shops which have already been wiped out by the early morning nonsense that took place at every retail outlet in the country. I did get to see the ultimate spectacle at Macy’s, which was a salesgirl in Ugg boots. Oh, Happy December to you all. Please keep the Christmas music away from me. I hope all of you are well, safe, and festive. Today’s gift of duct tape goes out to Mitt Romney, who can’t get a single fact straight. He needs a double wrap to keep himself from saying more far fetched things. I’ve managed to outdo myself and my friends on the grinchy post I did on Monday. A mix of satire and true sentiment, it’s a hard one to follow. Since I more or less got my negative ideas about Christmas out in the open, I’m doing a 180 on this one. While I’m not gleefully embracing Christmas cheer, the least I can do is offer my assistance when it comes to last minute gift ideas. As you know, one of my gift pet peeves is ties. My take on it is that unless you have impeccable taste, don’t do it. I’m sure you all have your ideas of those horrid gifts you don’t want but can’t quite say no to without hurting the giver’s feelings. This post could go on indefinitely with white elephant candidates, but I’m throwing out gift ideas that are hard to go wrong with. iTunes: Definitely a gift for the music lover and iPod user in your family. The cards come in different colors, shapes, and values, and can be redeemed for music, movies, audiobooks, TV shows, and movies on the iTunes store. Borders: If you know they like books but don’t quite know what to get them, this is perfect. Sephora: Why risk getting a perfume or cologne that isn’t right at all? Let them discover a signature scent or choose other kinds of cosmetics available to them. Perfect for fashionistas, metrosexuals, and everyone else. Target: It’s amazing how many Target whores (those who love shop at Target) there are. This card covers a multitude of gift ideas, meaning it’s easy for that person to get what they really want. Visa Gift Card: The most versatile of the gift cards, it can be used almost anywhere. There should be no excuse for bad gifts when you can get this. While these aren’t the only options out there, consider getting one of these instead of an awful physical gift they’ll never use. More ideas to come in the next couple of days.